Add flour, confectioner’s sugar, ground hazelnuts, vanilla sugar, and salt to a large bowl and stir for approx. 2 min., until combined. Add butter in chunks along with eggs into the flour mixture, and knead for approx. 5 min. until a smooth dough forms. Wrap dough in plastic wrap and refrigerate for approx. 60 min. Pre-heat oven to 180°C/350°F. Flour working surface and roll out dough until approx. 2-mm/0.1-inch thick. Use a cookie cutter to cut out cookies and place the cookies onto a parchment-lined baking sheet. Use a small round cookie cutter to cut a hole out of the center of half of the cookies. Transfer to oven and bake at 180°C/350°F for approx. 15 min., or until golden brown. Remove from oven and leave to cool. When cookies have cooled completely, dust the cookies with the hole with confectioner’s sugar. Heat jam in a saucepan over medium heat until smooth in texture, then add half a tsp. to the center of the cookies without the hole. 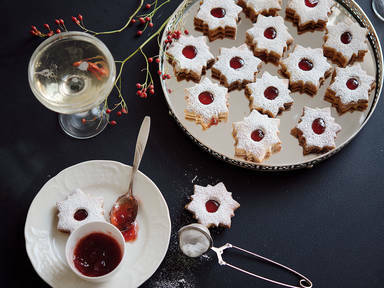 Place the cookies dusted with confectioner’s sugar on top and gently press down. Place on a wire rack to dry for approx. 10 min. Enjoy!